Damon & Naomi have returned from their "Lost Gaijin Tour" and have updated their web page with a few words about it as well as news of a couple of special dates for the end of January in NYC and Boston. The two dates will feature Damon & Naomi playing with Kurihara and will also include screenings of Naomi's films from the 1001 Nights DVD and a Q&A session moderated by Haden Guest, director of the Harvard Film Archive. Support for both shows will be from Sharon van Etten. The shows will be at 92Y Tribeca in NYC on January 30th and The Brattle Theatre in Cambridge, MA on January 31st. 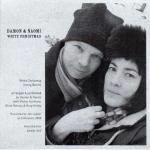 The update on their website also includes a Christmas pressie from Damon & Naomi, an mp3 download of their cover of White Christmas that was released on a very limited CDR last year and was featured in the film Lovely, Still. Head on over to Damon & Naomi's web page, read the full update and click on the Have a happy, everyone! link.